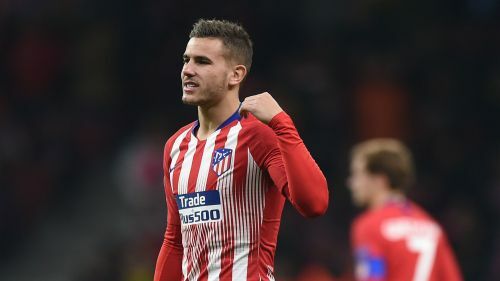 Lucas Hernandez is set for a spell on the sidelines after damaging the medial collateral ligament in his right knee in Atletico Madrid's victory over Deportivo Alaves on Saturday. France international Lucas was forced off in the 35th minute of the 3-0 win at Wanda Metropolitano when Jonathan Calleri landed on his leg following an aerial challenge. Atletico confirmed an MRI showed he suffered a grade two sprain of the MCL, though they offered no timeframe for his return. Diego Simeone started the match with Saul Niguez at left-back as Filipe Luis, Diego Godin and Juanfran missed out through injury. Lucas Hernandez underwent an MRI scan after Saturday's match that confirmed a grade II sprain to the right knee. Speaking prior to Atletico announcing the news, Simeone said of his defensive injuries: "We have to deal with what happens. "Hopefully it will be as little as possible. We will have Godin and Filipe for the next match, although not [Stefan] Savic, because of suspension. "Juanfran will be back on Wednesday. Some come in, others are out. Fortunately they are not all out at the same time." Atletico announced Lucas will "immediately begin medical treatment and physiotherapy". The France international was replaced by Jose Gimenez, who made his first appearance after a month out with a hamstring issue.